I am a big proponent of having it all. Why shouldn’t someone be able to have pizza and pasta for dinner (there is no greater joy than a ziti slice) or say, a career and children? But even I draw the line somewhere, and that line is dessert hummus. Yes, this is a very real thing, and yes, it is still made with chickpeas. Dessert hummus, which is quite literally blitzed chickpeas with the addition of sweet elements like maple syrup and cocoa powder, is an idea that has been floating around Pinterest boards for a few years now. There’s everything from banana bread hummus to pumpkin pie hummus and even a strawberry hummus that is a disturbing shade of grayish pink. The concept went mainstream in 2017, when the founders of Delighted By, a dessert hummus brand making flavors like choc-o-mint and snickerdoodle, got a $600,000 investment on an episode of Shark Tank. Since then, major brands like Boar's Head and restaurants like Hummus & Pita Co. have introduced their own versions of sweetened chickpea dip. Dessert hummus is essentially the modern day American Dream. While people once yearned for white picket fences and a sturdy suburban home built on a foundation of hard work and financial stability; these days, people seem to be more obsessed with figuring out how to consume large quantities of junk food without any guilt or consequences. This means being able to eat entire pints of ice cream (i.e. Halo Top) or entire pizzas by putting it on a cauliflower crust. Dessert hummus gives people just that: the taste of say brownies, or cake batter, or sugar cookies, but with all the fiber and protein of a container of hummus. The only problem? It’s terrible. Unlike Halo Top and cauliflower pizzas, which are reasonable facsimiles of the indulgent foods they attempt to mimic, dessert hummus misses on all fronts. Dessert hummus takes every ingredient that gives hummus its magic -- things like tahini, garlic, and lemon -- and chucks them out in favor of sugar, cocoa powder, and sprinkles. But it keeps the chickpeas. Dessert hummus is essentially the modern day American Dream. Regardless of how much sugar or sweetener is added, it spectacularly fails at fully masking the legume-y taste, and what you’re left with is a sweet-but-earthy paste that does nothing but piss off your taste buds. “Sweet-but-earthy paste” is not how I want cookie dough or brownie batter, or anything for that matter, to taste. And this is before we even get into the cultural appropriation conversation. At best, dessert hummus is like canned frosting with a lingering chickpea aftertaste. At worst, it’s a complete con. If the only ingredient dessert hummus shares with real hummus is chickpeas, can you even call it hummus at all? 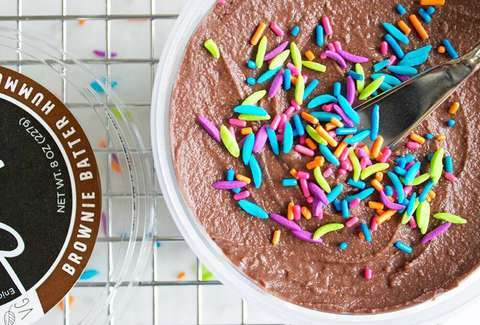 Sure, it might be a bit “healthier” than eating straight brownie batter from a tub, but is sacrificing your taste buds worth saving a few calories here or there? A better idea would just be to eat a bowl of regular hummus and follow that with a really good brownie, instead. That is truly having it all. Khushbu Shah is a Senior Food Editor at Thrillist and prefers her chickpeas savory. Follow her strong hummus options on Twitter @khushandoj.